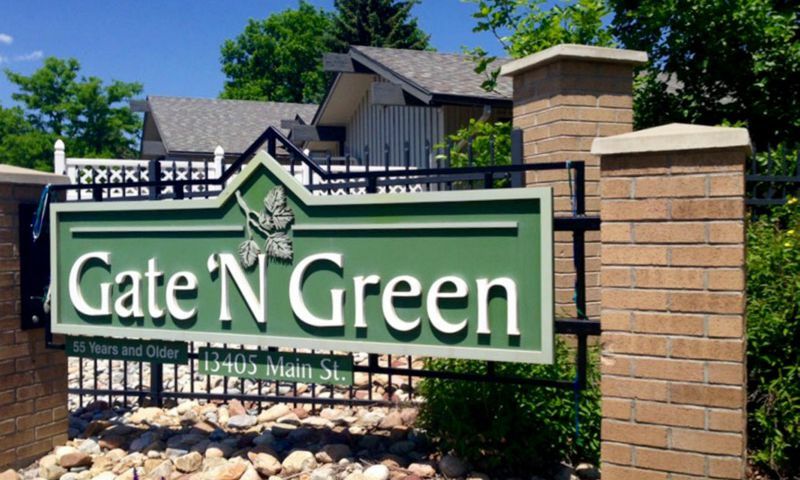 Gate N Green is an established 55+ community in Broomfield, Colorado. This gated active adult neighborhood features well-appointed amenities within a tranquil and welcoming setting. With just 300 ranch-style homes, getting to know your neighbors is easy. A close-knit atmosphere also promotes a social and vibrant lifestyle where residents participate in a variety of events and explore recreational activities with other like-minded adults. At the center of this age-restricted community is the clubhouse. It provides all of the amenities and recreational opportunities that homeowners could want or need. Residents maintain an active lifestyle by swimming laps in the indoor pool or working out in the exercise room. Afterwards, they can relax in the sauna. Neighbors can get together in the multi-purpose room or prepare a snack in the catering kitchen for a fun evening with friends. Outdoors, homeowners can enjoy the beautiful walking and biking trails that surround the community. There are plenty of areas in the neighborhood to get fresh air and enjoy scenic views with all of the ponds, parks, and natural space available. An R.V. parking facility is also conveniently located in the community for residents who love to take road trips. Gate N Green was developed between 1972 and 1999 and consists of 300 single-family homes. They offer approximately 1,008 to 2,432 square feet of living space and have two or three bedrooms, one or two bathrooms, and an attached two-car garage. These spacious ranch-style homes have been well-maintained throughout the years and some include upgrades like hardwood floors, stainless steel appliances, skylights, and covered patios. An affordable monthly homeowners' association (HOA) fee includes access to amenities, snow removal, and exterior home maintenance. This 55+ community promotes a physically active and socially engaging atmosphere where neighbors can relax, rejuvenate, and share interests with each other. Residents can benefit from all of the activities, clubs, and events being held in the clubhouse. This social hub offers arts and crafts, bingo, bridge, holiday parties, and fitness groups. Neighbors can mingle with other adults at potlucks or luncheons. Homeowners are encouraged to explore their creativity as well as new hobbies. Making friends is easy in this welcoming and vibrant community. Ideally situated in Broomfield, Colorado, residents are near everyday conveniences and countless attractions. Major roads like Highway 287 and 36 are great for driving around town. Within a ten-minute drive homeowners will find a Walmart as well as Broomfield Town Center, which is home to a bank, grocery store, The Home Depot, and restaurants. Golfers are just 14 minutes away from their next round at Eagle Trace Golf Club. Outdoor enthusiasts will also love having plenty of parks and open spaces nearby such as Broomfield Community Park, Ruth Roberts Park, and Carolyn Holmberg Preserve. For big-city entertainment, Boulder is about 25 minutes away. There, residents will find a variety of museums, fine dining, and retail shops. Denver is just a bit farther for additional recreation and attractions. When traveling long distances, Denver International Airport is about 35 minutes away. Active adults will love the amenities as well as proximity to great attractions while living in Gate N Green in Broomfield, CO. There are plenty of activities available in Gate N Green. Here is a sample of some of the clubs, activities and classes offered here. Gate N Green was developed between 1972 and 1999 and consists of 300 single-family homes. They offer from approximately 1,008 to 2,432 square feet of living space and have two or three bedrooms, one or two bathrooms, and an attached two-car garage. These ranch-style homes have been well-maintained throughout the years and some include upgrades like hardwood floors, stainless steel appliances, skylights, and covered patios. Please Note: Floor plans are not available at this time. 55places.com is not affiliated with the developer(s) or homeowners association of Gate N Green. The information you submit is distributed to a 55places.com Partner Agent, who is a licensed real estate agent. The information regarding Gate N Green has not been verified or approved by the developer or homeowners association. Please verify all information prior to purchasing. 55places.com is not responsible for any errors regarding the information displayed on this website.